A breakthrough study was published in the March 8, 2012 issue of Nature — the first real-time images of two atoms moving in a molecule. Why is visualizing the movement of atoms challenging? Both the time scale of femtoseconds and sub-nanometer length scales have been beyond the resolution of existing experimental techniques. Recently, X-ray diffraction and electron diffraction were used to infer the location of atoms in a molecule but there were no methods to directly visualize the atoms. Until now! 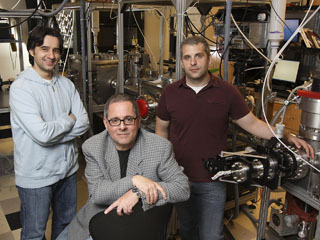 Led by AAAS member Louis DiMauro, Ohio State University, the team has used Laser-induced Electron Diffraction (LIED) to obtain sub-Angstrom spatial resolution. The team used this method on small molecules such as oxygen and nitrogen. The hope is that this technique will allow us to visualize chemical reactions between atoms and 'steer' the reaction in a desired path. To understand more about this work, AAASMC blogger, Padmini Rangamani spoke with DiMauro. AAAS MC: How did this breakthrough come about? Can you please share a history of this work? Louis DiMauro, Prof. at Ohio State University: To give an accurate account of history is always difficult and misleading, and this case is no exception. However, I believe that the conceptualization of much of the current work in molecular imaging and attoseconds began with the discovery of the quasi-classical model of strong-field rescattering back in 1993. The model describes the ionization dynamics that result from an intense, ultra-fast pulse interacting with an atom or molecule. The model was forwarded by two groups: our collaboration led by Ken Kulander (LLNL-now retired) (PRL 70, 1599 (1993)) and Paul Corkum (NRC-Canada) (PRL 71, 1994 (1993)). For example, this model provided a foundation for the eventual realization of attosecond pulses in 2001. The model also started people thinking about how the electron's rescattering event could be used to interrogate the system (atom or molecule) from hence it came. There are many groups that contributed to this understanding, both theory and experiment, and citing them will ultimately be incomplete. So let me only mention a few institutions, Imperial College (UK), NRC (Canada), Kansas State University, Saclay (France), Stanford and of course Ohio State. I should also mention different diffraction approaches using ultrafast bursts of electrons at Caltech, MPI-Garching and U Toronto. Within the context of rescattering, various approaches have been studied by either (1) observing the coherent light emitted (high harmonic generation) or (2) measuring the electron momentum distribution that resulted from the light-atom/molecule interaction. Our group investigated both approaches but we felt that the second might be easier to interpret and less theory dependent since we would be making a measurement on an isolated molecule. Over the past decade, our group has been developing long wavelength tools that provided the enabling technology needed for exploring this physics. It was my hope that we could develop an imaging method that would be close to a direct measurement of atomic position similar to the standard method of gas-phase elastic scattering/diffraction (GED). The new features are many but one would be temporal-resolution on the femtosecond or maybe the attosecond scale. This is absent from the standard method. Our group was stimulated by the theory being developed by Chii-Dong Lin (Kansas State University). His work, dubbed the quantitative rescattering theory, provided an essential link between our measurement of the electron's momentum distribution and extracting atomic position. I should mention that Lin and I are both funded by the same DOE program. AAAS MC: What are the challenges in applying the technique to larger molecules? DiMauro: I do not know the answer to this yet, but I am optimistic. The standard GED approach has been applied to a broad range of molecules from small to large, e.g. macro-molecules. In our method, if the influence of the external laser field is properly accounted then the analysis of our momentum distribution follows the same procedure of GED. The big "if" statement is the focus of our future research, but the Nature article demonstrates that these principles are sound for simple diatomics. It is worth noting that we have a variety of tricks that can be implemented in our method for further investigation. For example, using known techniques we can fix the molecular axis in the laboratory frame allowing us to take different projections and perhaps a 3D image. Another will be the ability to conduct a pump-probe arrangement, where some ultrafast pulse will initiate a physical or chemical molecular process whose positions can then be probed at different times by the LIED method. These tricks cannot be implemented in standard GED since they are essential static images. AAAS MC: It seems that this path breaking research is a combination of excellent theoretical and experimental work? Can you please comment on how that interaction works? DiMauro: As I mentioned above, the interplay of theory and experiment was critical and at this point of time are strongly coupled. First, theory provided the underlying principles not only for imaging but also our thrust for incorporating long wavelength lasers into the exploitation of the rescattering process (see Tate et al., PRL 98, 013901 (2007)). Second, our studies are only scratching the surface and several fundamental questions must be addressed, so continued joint investigations are needed. AAAS MC: You mentioned that the goal was to be able to visualize chemical reactions and steer reactions in a 'desired' path. How far, or close, are you to that goal? DiMauro: We are not that far from demonstrating this principle for a unimolecular decay, e.g. dissociation. The idea is to initiate a dissociation of a molecule using an ultrafast UV pulse. This will be followed by our intense LIED pulse which will probe the atomic positions as the atomic constituents move apart as a function of time. Similar to the concept of a movie, once you can watch motion, you can also freeze it and intervene. Demonstrating this control will probably take a few years but the first step has already begun. AAAS MC: Can you comment on how this research can help us address the energy challenges faced by the modern world? DiMauro: Again a difficult question to address at this early stage but let me defer to a 2007 report of the DOE Basic Energy Sciences report entitled "Directing Matter and Energy: Five Challenges for Science and the Imagination" which examined the future of energy research. In recognition of the potential impact of recent technical advances the DOE panel enumerated five grand scientific challenges. The need to "control materials processes at the level of electrons" was cited as one challenge where novel tools, such as reported in our Nature paper, are the enabling technology. There has been a tremendous investment world-wide, e.g. XFELs, synchrotrons, attoseconds, to meet these challenges and our approach is one means to this end.